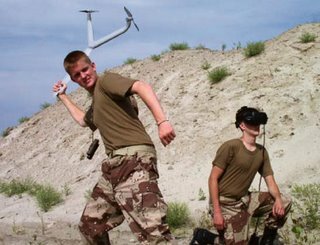 Minnesota company VeraTech Aero Corporation makes the Phantom Sentinel, a powered unmanned flying vehicle for surveillance that is invisible in flight. The UAV is sort of like a powered boomerrang. The whole aircraft spins so fast that it simply disappears from sight. It relies on human 'persistence of vision'. The Phantom can fly by GPS or remote control and can hover in place. They can be any size from 2 to 10 feet across and are foldable for storage. It runs off batteries - the specs do not say how long it can stay aloft. did you watch the videos? it's definately not invisible in flight, the videos on the site are totally manipulated. watch carefully, they just threw in a blur filter. it claims to work based on the principal of "persistence of vision" but POV doesn't make the center of a spinning object invisible. but the video suggests that it does. it's a neat concept but worthless in practice. yes, but no one will be watching the skys for a small black object twenty four seven! i mean, people have more to worry about! Even if they were looking for it, it could get easily overlooked or mistaken for a bird.